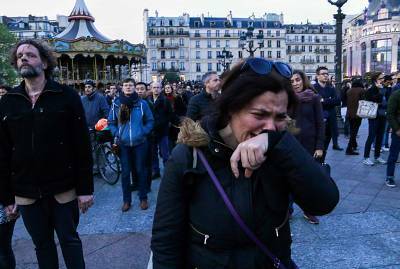 PARIS — In the most solemn week of the Christian calendar, Paris is in mourning. The charred scaffolding of Notre Dame Cathedral stood out like a scar in the gray sky of the "city of light" early Tuesday. As it drizzled, there was a gaping hole where the landmark's roof would have offered protection. Some made a point of taking time to pause and pay their respects during the French capital's buzzing rush hour. "People have come as if they are visiting a sick friend," student Jossien Prouteau, 22, said while standing on a bridge across the the Seine River that connects the Left Bank with Île de la Cité — the island where Notre Dame is situated. "Watching the flames last night was like watching a woman being beaten up without being able to do anything." As a practicing Catholic, Prouteau said he would typically spend a few minutes each day thinking or praying outside the cathedral. "I'm in mourning," he added. "It is not only a beautiful work of art aesthetically but there is a spiritual connection." 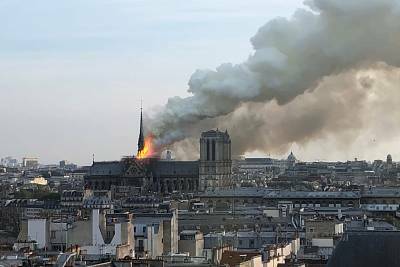 Others on the banks of the Seine expressed a common sense of disbelief that Notre Dame, which embodies so much of French identity, history and culture, could be left in such a state by flames. "It's been something we've always seen, we passed by it without paying attention, but today we're measuring up how much this building means to us," said Pierre Ribette, who had come to take photos of the ruins to send to his children who live abroad. 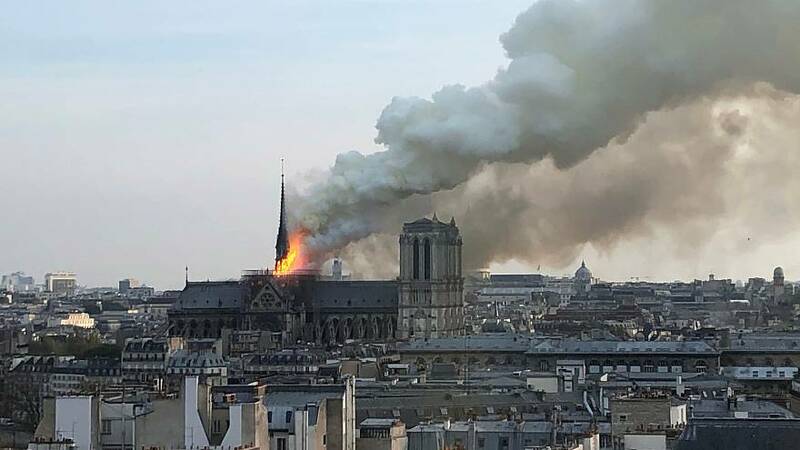 Hours earlier, crowds gathered after dark near the monument to sing the "Hail Mary" as fire swept across its roof and threatened to raze the greatest of Gothic cathedrals to the ground. Nearly 400 firefighters battled the blaze. Human chains were formed to rescue relics and priceless works of art including a crown of thorns some believe to have been worn by Jesus Christ. "The crown of thorns, the tunic of St. Louis and several other major works are now in a safe place," Paris Mayor Anne Hidalgo said on Twitter. It remained unclear Tuesday how the fire had started but authorities said the incident was being treated as an accident, prosecutors said. It wasn't until late at night that a city official said the structure of the building — including its two famous bell towers — had been saved. By the time the fire was successfully extinguished, crews had been battling the blaze for some nine hours. French President Emmanuel Macron pledged that France would rebuild the 850-year-old cathedral considered to be one of the most important Christian places of worship in the world. The popular tourist attraction welcomes some 14 million visitors each year and was undergoing renovations. But some people around the Île de la Cité Tuesday were under no illusions about how long it would take to return Notre Dame to its former glory. "It's such a symbol for everyone living in France, everyone in Paris," said Jane Winfield, 58, who moved to Paris from Britain around two decades ago. "I regret that I may not live long enough now to see it fully restored."